Marketing and the future of physical therapy. For the physical therapist, particularly the private practice physical therapist, the landscape has shifted in recent years. And the pace of change promises to increase. Many practices and practice owners don’t seem to have really caught up with all of the changes that have already happened, though we all certainly feel the effects on a daily basis. Many, perhaps most, of us are still operating in a “physician referral with third-party payers” model—this while an ever-increasing percentage of American employees are covered under employer self-funded insurance plans. The old third-party payers are now acting as third-party administrators, providing the employers with the same information as when they were collecting premiums and making the payments from their own accounts. This is problematic in that many employers’ systems and incentives are siloed. What that means is that a vice president at Cigna might be responsible for saving or reducing costs in a specific area like imaging, or physical therapy, or maybe even what they call alternative medicine. These silos create incentive structures to reduce expenses within that silo, irrespective of the effects on any other silo. The net effect is that effective and inexpensive interventions, like those provided by physical therapists, are rationed, limited, capped, and denied in an effort to decrease costs, resulting in increased expense in other silos. Spending on effective and inexpensive treatment options, resulting in decreased expenses in other silos, is not considered an investment; it is looked at as a cost center. The entire pie of spending is not being considered. The idea that if we invest in one area we could reduce costs in another is being ignored. There have been plenty of studies to show that investing in physical therapists, getting more people to a physical therapist, reduces other musculoskeletal costs both upstream and downstream. Getting people to physical therapists earlier reduces complications such as infection and complications from surgery. But the system is not set up to take advantage of this nor to exploit it for better patient care and improved cost savings. This provides an opportunity to educate the employers, who stand to gain on multiple fronts. They stand to gain by reducing their musculoskeletal spending, which accounts for a significant portion of their overall medical spending. They stand to gain by keeping people at work and productive and out of pain. They stand to gain by making their employees happier with the outcomes and the interventions that physical therapists provide that others simply don’t. But they are not getting that information from us or from anyone else. They are not hearing this message. This creates an opportunity to market directly to employers. And the focus of the marketing message should not only be on how to prevent or reduce workers’ compensation claims. These self-funded employers are now accepting the financial risk regardless of where the employee is injured, hurt, or sick. They are “on the hook” whether the employee sustains an injury while at work or while playing league softball. And this means employers have a financial incentive to help their employees be more active, get stronger, and maintain their health, and to get the best, most effective interventions when they need it. Employers understand the financial benefits of having healthy and fit employees, of course, but are they aware of the multiple benefits of physical therapy? This opportunity also has the potential to not only increase physical therapists’ patient volume, but to intervene earlier, and to get paid what they are worth. 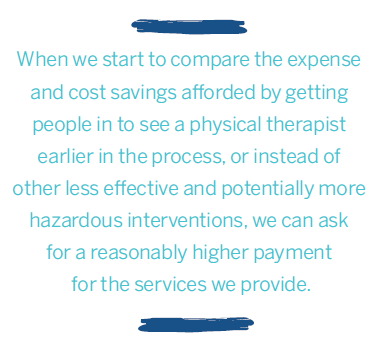 When we start to compare the expense and cost savings afforded by getting people in to see a physical therapist earlier in the process, or instead of other less effective and potentially more hazardous interventions, we can ask for a reasonably higher payment for the services we provide. A single spinal fusion surgery can cost upwards of $100,000. A typical course of treatment by a physical therapist currently runs around $1,000. We’ve been comparing ourselves to ourselves, instead of thinking in terms of how effective can I be at preventing spinal fusions or other surgeries. We’ve fallen into a trap, when we ought to be comparing the value we provide and the outcomes we provide to the value and outcomes of other interventions, interventions that are far more costly and potentially fraught with complications. Another area where we have an opportunity to realize a positive impact is by becoming truly client centered. Many companies pay lip service to this concept and create initiatives or marketing messaging to say that they’re going to focus more on the customer, the patient, or the client. But going beyond the message and the motions and truly focusing on the experience of your target customer, rather than having the mindset of competing for a limited number of patients, can itself provide a competitive advantage. We have to stop thinking in that old way. When we look beyond ourselves while considering the competition and where patients are going, the market—the number of people we can help—is actually many times the number of people we are currently helping! We should consider that people who could otherwise benefit tremendously from physical therapy are instead choosing other interventions. They are buying things online, or listening to the infomercial, or taking opiates as prescribed by a doctor, or perhaps not even those prescribed. They are going to massage and acupuncture. They are getting treated in myriad other ways that are simply not as effective. Or worse, they are sitting on the couch ignoring their issue until it progresses to such a point that they can no longer ignore or avoid it, instead of doing what is in their own best interest earlier. And meanwhile, maybe from a distaste for the whole idea of doing marketing, we as a profession have been too passive. But not taking action is serving neither our profession nor our patients nor the health care system in general. If we’re not spreading the word about what we do and how we can help people, if we’re not sharing our knowledge and value with people, many of whom are literally in pain, then we are doing society a disservice. We have something, you have something, special to offer. And by convincing ourselves first of that, and coming to terms with it, and realizing that we have an ethical obligation to tell other people about it—that, in and of itself, is where marketing should begin. We can positively impact society by simply telling people what we can do. We can positively impact society by showing people how we can help them. We can positively impact society by demonstrating the value we can provide to them in their lives. We can positively impact society by sharing these messages through multiple channels. You may be able to share this message through workshops, videos, blogs, and speaking opportunities. You may be able to share this message through articles, or conversations with family and friends. You may be able to share this message with a patient who is a key decision maker in their company who does not even know they have an opportunity to positively impact thousands of lives. You have an opportunity to share this message and positively impact more and more people. Through your profession you have the opportunity to do your part in transforming society for the better. Tell people what you can do and how you can help them. Demonstrate how you can improve the quality of their lives. How can you do this, exactly? Talk with your family and friends, especially those who work in health care. Talk with an acquaintance, maybe a patient, who is a key decision maker in their company who does not even know they have an opportunity to positively impact thousands of lives. Give a talk to policy-making individuals at a local large employer. Give a lunch-and-learn talk for employees at local companies. Address their needs: In their work, are they subject to back pain from lifting? Pain from repetitive motions? Stiffness from sitting at a computer? Carpal tunnel syndrome? 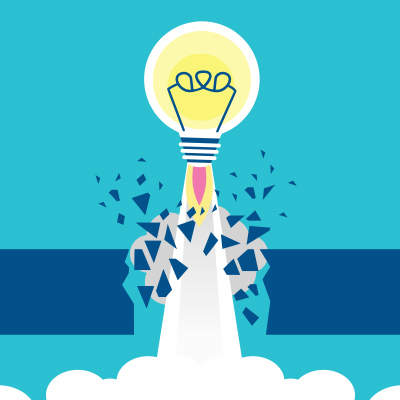 A final thought around the future of physical therapy is that disruption is coming. Multiple other industries have seen massive disruption. Try to find a Blockbuster. Try to buy Kodak film. Try hailing a taxi. Other industries are currently being disrupted. They are in transition, like the automobile industry, like the energy and fuel industries, like hotels. Health care and health insurance will be in transition at some point in the near future. Ignoring, denying, or avoiding is not an effective strategy. Instead, you have an opportunity to join in the disruption and thus to serve more people. You have an opportunity to expand your reach in providing effective and efficient alternatives to more expensive and more hazardous interventions that result in the same, or inferior, outcomes. I challenge you to update and change your thinking. I challenge you to view your offering, and our profession, from the perspective of the patient, the employer, and the person who needs your services. I challenge you to really look at things from their point of view, and to see the good, the bad, and the ugly—the reality. 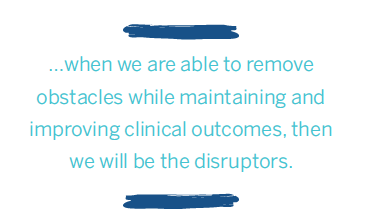 When we are able to put ourselves in their shoes, when we are able to improve service, improve speed, improve convenience, and when we are able to remove obstacles while maintaining and improving clinical outcomes, then we will be the disruptors. Sturdy McKee, PT, MPT, is a chief executive officer, entrepreneur, physical therapist, and business coach who can be reached through www.SturdyMcKee.com and on Facebook @ Sturdy.Coaching. * The author has a vested interest in the subject of this article.